One of the things many of us struggle with when creating our visual identities is choosing the right fonts – they have to fit the brand design and also work well together! That’s why I created this collection of my favorite font pairing using only free fonts. This has taken me a few years of experience to put together and I’m happy to finally be sharing! Note: this does not include actual font files. 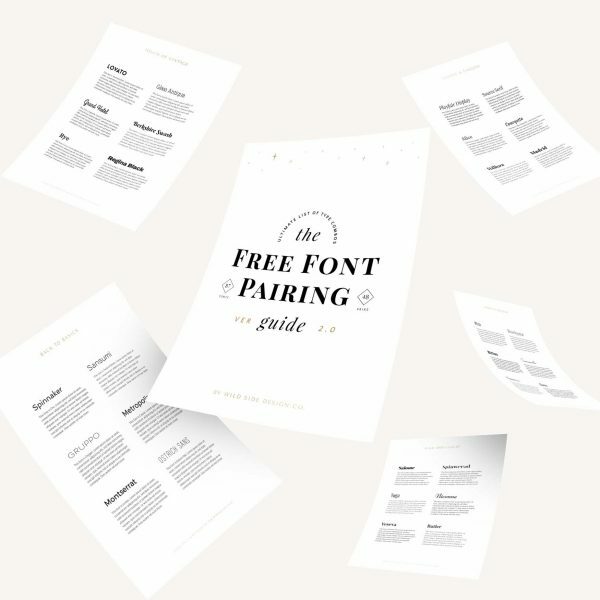 This is a PDF guide with links to download the free fonts for yourself. All of this presented in an easy-to-read PDF with clickable links to that you can save or print out. We love to hear how you use our pairings – shoot us an email to share your work! We’re here for the wild ones, the free spirits, and the untamable souls; the ones with bare feet, messy hair and big hearts. Our mission is to help the trailblazers of tomorrow, those determined to challenge the status quo, make a difference in the world, work and adventure on their own terms, and live to do what they’ve been told is impossible. Sign up for product updates, freebies, discounts and more!